Sometimes you have to give control of your life to someone else and trust that at the end of the experience you are still intact but more importantly alive. 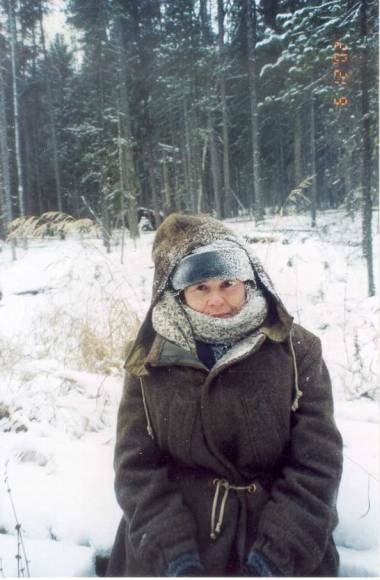 This was the case for me and my friend Anne Marie, we were in Siberia, the Taiga and temperatures were –50. Who was looking after us making sure we were returned in one piece to our parents, family and friends, two Russian hunters (Viktor and Tolka). How did two independent, sane (sometimes) western women end up in Siberia, in December, on a hunting trip? We had always wanted to do the Trans Siberian Railway (not in summer as most tourists do) but in the middle of winter and experience a cold Russia and an even colder Siberia. Most people know that thousands and thousands of people were sent to Siberia to work in Gulag camps and never heard of again. They experienced a cold that would kill them and a region that they could not escape from. We wanted to go and see what Siberia was like today. We arrived in Severobaikalsk on the 25th November and were met by Rashit Yahin who is incredibly knowledgeable about the region and arranges all kinds of tours. He greeted us with a big smile and informed us that he had found someone who was willing to take us hunting. He introduced us to our guide Viktor, the man who would take care of us, feed us, keep us warm, and make sure that we survived. He had a happy smiling face, hair that would constantly flop over his eyes and an energy that was contagious. He seemed thrilled to be taking the first tourists hunting in Siberia in winter. 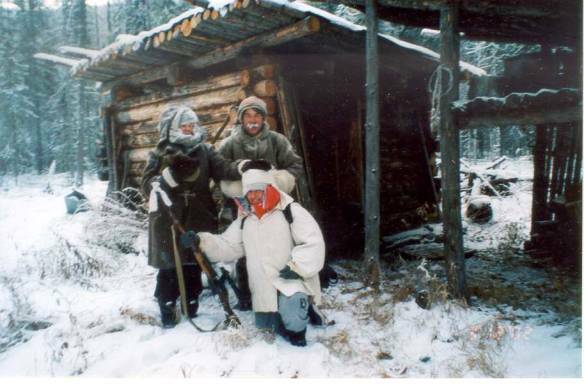 He was going to take us to his hunting huts and show us how he survived, lived and worked in the Taiga region. The roads are virtually impossible to travel on especially in winter and have not been renovated since 1973. However, we were lucky the next day we would able to get a ride on a huge machine (truck). Early, the next morning we set off, Anne Marie jumped in the front and I was given a leg up in the back. No comfy seats just a warm blanket and deerskin to sit on. A small stove was constantly stuffed with wood and this was our only way of keeping warm. Victor was so concerned that I might be cold he kept wrapping blankets around me, and putting more wood in the stove and asking if I was okay. I was introduced to Tolka who was going to accompany us and help us. He was also a hunter and made fur boots and hats. He had a lovely smile and didn’t seem to be worried about taking two tourists out into the wild, a language barrier and a region that was so harsh. After a lot of jolts and jumps we finally stopped and it was time to eat. We had stopped near an offering tree, that travelers had hung ribbons and material and left presents (cigarettes and matches even the occasional vodka) all these gifts left in the hope that they would have a good journey and stay safe. I offered a match and prayed that who ever was taking care of us liked foreigners and that perhaps he might appreciate the American cigarette that Anne Marie had given him. A fire was ablaze within minutes, the kettle boiled and tea was made. A big wooden box was open and inside was bread, cheese, salami, and pickles everything was cut up and we were invited to eat. The tea warmed the body and the food was a welcome relief. Then as quickly as the food appeared it was put away and we were on the road again. After 10 hours of a real roller coaster ride we stopped and they informed us it was time to get out. Where were we? Not a light in sight, a building nothing. Just total blackness, complete silence, and a cold wind blowing through the night. Anne Marie and I looked at each other. I am sure our eyes were saying, please don’t leave us here, we want to go back to civilization. Help!!! Victor informed us that we had to walk maybe 200 meters to the hut and to just follow him. We lifted our backpacks, hugged our driving companions and started walking into the night. Thankfully we had torches to light the way and gingerly stepped in Viktor’s footprints. I am crazy, I am mad, what was I thinking all these thoughts racing were through my mind but it was too late the big machine had gone and we were all alone. Not another person for 45 km our adventure was beginning. Viktor lets out a shout we have arrived at base a small cabin enough room for 4 to sleep. They quickly cut the wood and a throw it on to the stove and within minutes the cabin is warming up. The kettle is boiling and bread and cheese have appeared. These men they take control they get things done. I begin to feel that perhaps we will survive. We drink large warm, sugary cups of tea and eat the bread and cheese. Boy food has never tasted so good. Viktor informs me that I will be sleeping on a small mattress and reindeer skin and as I climb into bed, I have never felt so comfy and snug. We wake up in the morning and take a look outside the snow is still on the ground but it is a clear day and today we are walking 6km to the main base. There is no trail – Viktor has memorized the trees and scenery, he has no compass, no map just his internal knowledge and experience will get us to our destination. Our backpacks are not too heavy as we were told to only pack what was essential and for once I did. Then we are off, trudging over bracken, as it breaks under our heavy weight, weaving through trees and bushes. There doesn't seem to be a path but Viktor is confident and I follow in his tracks. It all looks the same to me and I walk quickly to keep my eyes on Viktor. Then he stops and in front of us is the River Svetlaya and in places it is frozen and elsewhere you can see the water raging. Great I think we are stopping for a drink, but no, we are going to cross it. He must be mad, what happens if the ice cracks? We will be swept away. Anne Marie will have to tell my parents that hopefully my body will be recovered in the summer floating in Lake Baikal. So, how will we cross the frozen river? Of course he must have some amazing technical machine that will calculate the depth of the ice and whether it is safe or not and as he disappears I let out a huge sigh. Thank god for modern technology it will probably take 30 mins to cross once he has calculated all the measurements, depths etc. He reappears and what do I see in his hands? A stick a common garden stick that he has broken off a tree. That is it that is what he wants to use to travel 25 meters across the ice, a stick! He steps onto the ice and starts to tap, he listens to the sound and takes a step forward or backwards where the ice is thin. Then he turns around and signals for me to follow him. I look at him and he beckons to me again, so against my better judgement or maybe because I had no choice I step softly onto the ice. Then miraculously we have reached the other side we are standing on the bank and looking out along the trail. We are safe we made it. I turn to Viktor and hug him. He looks nonchalantly, he does this all the time it is no big deal but for me and Anne Marie we are exhilarated, our hearts are still pounding, we have made it. We take one last look and listen to the ice cracking behind us. We eventually arrive at base which is more comfortable and bigger that the first one. Viktor built this wooden hut in 1995. He has some large benches that me and Anne Marie can sleep on and him and Tolka have two smaller ones. He has a table and a lamp and a huge stove where we can hang our clothes to dry and where we can get warm. In the summer he helicopters food in so we have reindeer meatballs and rice and yes, he even has biscuits. We sit around the table happy and content and with the help of a small dictionary communicate to each other. Even though we do not understand each other through facial gestures and acting we manage to have a stimulating conversation. Once again we sleep on reindeer skin and a mattress the cabin is so warm, we are refreshed and watered and we both sleep blissfully. We have made it we have survived the first day. During the days to come Viktor and Tolka took us on hunting trips they showed us how to lay traps and nooses. How to distinguish the tracks, reindeer, squirrel, and sable. In the afternoons we would watch the reindeer grazing on the mountains. We would collect birch bark as it is the best thing to use to start a fire. We passed two shaman’s huts, they were killed in communist times and many of them escaped and lived in the woods. We walked to his other huts, shooting squirrel along the way. Yes I am afraid it does taste like chicken. Viktor let us use his pellet gun one afternoon and set up a target for us to shoot at. He showed us how to line it all up and to let out a huge breath and then shoot. Maybe I was a hunter in my past life because both myself and Anne Marie managed to hit the target or to get within 2 inches. Viktor was proud of us although we didn’t have the privilege of shooting his father’s 1930 Winchester gun. The hunting trip was successful they managed to kill a reindeer (thankfully we did not get to witness it) 5 squirrels and joy of joy for the hunter a sable. Once Viktor saw it in the trap he got on to his knees and said a prayer to the shaman giving thanks. He can make approx. $120.00 for a sable skin. This is his life, this is what he does, this is how he survives in Siberia. Sometimes it is hard for us to accept that people hunt but when I saw the respect that he has for nature I couldn’t help but be pleased for him. At one time the sable was almost hunted to extinction but now all the hunters have to register and they are only allowed to hunt a certain amount and everything they kill has to be registered and I was happy to see once we returned to civilization Viktor registered everything. Most of the hunters have a region per family and now that there are tighter controls the sable is once again living and thriving in the woods. We returned that evening and they showed us how they prepared the animals, they skillfully skinned the sable never using a knife but sometimes their teeth so as not to damage the precious skin. Me and Anne Marie sat there fascinated as he peeled the skin away, skillfully. The squirrels also had their fur removed but it was not done as carefully as the Sable. They were not as precious but they would give him some income to survive the cold winter ahead. During the days they would tell us what we could eat I must say they have some delicious natural chewing gum, you have to chew it for a long time as it crumbles in your mouth and then you spit bits out. After 15 mins of spitting and chewing it eventually becomes the same consistency as chewing gum and even has a minty taste. We made tea from some many different plants and herbs and they each tasted delicious, we barbecued the reindeer’s heart and the meat was so soft and tasty. He showed us where the bears had hunted for rabbits, where they had rubbed up against a tree when they had an itch, and where they were hibernating for the winter. Time passed – we kept in contact with the outside world every 3 days with a CB radio. Tolka seemed to be on an exercise bike as he pedaled away furiously to enable Viktor to make a connection. Problems though, a snowstorm was heading our way and it was coming quickly – it had already headed through Novosobirsk and Yekaterinberg and was now in Irkutsk. We asked what that meant and they informed us very calmly that a lot of snow was on the way and it could snow for one day or even 10 days or more. Of course being the girls we are shouted “get us the hell out of here”. Viktor tried to contact people to come and get us but nobody wanted to leave and get caught in a snowstorm. We were on our own it was up to us to help ourselves and that’s when Viktor informed us we were going to have to walk 45km to the nearest town along the frozen icy road that had huge crevices and holes and twisted and turned. We both looked at him as though he was mad but he was quite serious. I asked him if we looked like we could walk 25km yet alone 45km. But there was no choice and we spent an anxious, restless night pondering the situation in front of us. The guys carried our backpacks and essential food in the hope that perhaps we could walk faster and easier. We all had to pray that a machine would go by and pick us up but that didn’t seem a reality. It was a lovely morning no sight of the snowstorm, the sun was trying to shine through the clouds. 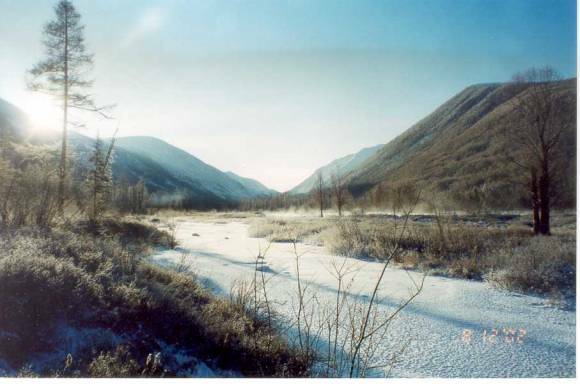 We walked through the woods and over the frozen river again, walking quickly and calmly we managed to make it to the small hut where we would rest. The next day we had to walk 35km and there was not another hut to rest in. Viktor waited along the road in case a machine went by and we made tea and chopped wood and contemplated the rest of the journey. Then a miracle the door opens and it isn’t Viktor but another person. I pounce on him "bolshoie machine (big truck) yes! yes! thank you god hurrah"... But he looked at me and said no he didn’t have a machine he was also walking to the next village Komora. I looked at him in disbelief another crazy person walking, he was just resting and then going to carry on. Tolka talked to him and we realized that in fact it was only 30km to Komora and in fact there was another hut 6km away that we could sleep in. We ran and told Viktor and decided to walk another 6km in the daylight so we would have less to walk the next day. The hunter’s name was Dennis and he was 24 and out in the wilds all alone. He informed us that he would take us to the hut and then he would carry on. We set off slipping and sliding along the way walking in the trenches of the road where the wheels of the trucks had got stuck. We all fell over along the way but thankfully none of us were hurt. We managed to make it to the next hut in good time and Dennis and Tolka chopped the wood and a fire was soon burning. Every hunter chops more wood than they need so there is always wood available when someone arrives at the hut. It is like a code of honor that the hunters have, never to leave anyone without wood to heat the huts. There was no water so they went down to the river and cut out huge blocks of ice, which they thawed over the fire. These men they don’t hang around they know what needs to be done and get on with it. Before we knew it they had heated up the noodles and we were all sitting around enjoying another hot meal. Dennis was intrigued about two European women in a remote area and we told him we were cuckoo (crazy) and he laughed and agreed with us. He didn’t know any English either but we were able to communicate to a certain extent. Then Dennis announces that there is another hut 15km away and tomorrow when we leave early we can stop there for a rest and a cup of tea and then joy of joy he tells us that he will accompany us tomorrow. Here he is a complete stranger who could be home in 5 hours willing to help us and stay the night. Now he will stay the night and walk slowly with us showing the way. How could we ever thank him? The hut is really cold and damp. It has probably not been used for a long time and even though we keep putting wood in the stove none of us are getting warmer. The temp has dropped to –45 and we are beginning to freeze ourselves. We all sit huddled together trying to keep warm and drinking tea but we still have our sense of humor and all laugh at the situation we are in. Then slowly the cast iron stove begins to heat up and we can feel the warmth in the hut. We decide that perhaps we should try and get some sleep and the guys put our sleeping bags and coats and jumpers and everything else over us. Me and Anne Marie drift off exhausted. Around 3.00am we feel that our bedding is being arranged and they are tucking us in and covering us over and when we wake up and touch their hands they are frozen. Luckily us two hot bloodied women were warm and we all snuggle up together to keep from getting cold. None of us really sleep but at 6.00am we eat the leftover food and head off for a long arduous trek. Dennis also helps Viktor and Tolka by carrying some of our things, he has quickly become a member of our family. After 3 to 4 hours of constant walking and slipping on the ice, Dennis tells us there is a way we can walk along the frozen river and because it is covered in snow it means we will not slip so much. So off we head and he is right our boots are able to grip the snow and we soon start picking up the pace. We reach the hut and have time for a cup of tea there isn’t much food left so we have a piece of bread and then head off. We walk for another 2 hours enjoying the warm sunshine on our faces and happy that the snowstorm seems to have passed us by. Then we hear it a loud thunderous noise behind us. It is a machine (truck) and it is going our way. The driver looks so surprised to see all of us. Three hunters dressed in their brown hunting gear and two western female tourists. Thankfully, he agrees to let us ride in the back of the truck and we spend the next 1/2 hour in the back of a meat truck with deer and cow carcasses but we are all happy to have a ride. The driver stops and we all get out, the road has changed to a two lanes and is smooth and straight. The guys tell us it is 2km to Komora. We head off with a spring in our steps, we have almost made it and then in the distance are the mountains, the sun is shining on them and they gleam to welcome us. We see the smoke spiraling into the air and then there it is Komora. Beautiful wooden houses everywhere no concrete soviet buildings. We pass a man on the street and he gives us a funny look and we all start laughing, he wouldn’t believe us if we tell him. We have made it, we are in Komora, we are back to civilization. The hunters kept us safe, they made sure we survived. Finally, here in Siberia, one of the coldest places on earth we have found what we had been looking for – the Russian Soul.